Food masters say that if you do not know your history, you must know the culture of your local food to preserve your identity. People want local cuisine. They want the taste of the Philippines- this is what drives Marco Polo Plaza Cebu as a hotel to continuously protect the international part of their restaurants at the same time keep a deep knowledge and affinity for the local cuisine. Also, without this concern in mind, the younger generation may be driven away to the fast-food outlets as opposed to the laborers and the very intrinsic past of our food heritage. In line with this significant cognizance, Cafe Marco presents another Culinary Journey called "Treasure Recipes". This time, to serve us treasured cuisine handed across generation, “Treasured Recipes” are prepared by the hands of two of Cebu’s Culinary Icons: Ms. Cristina 'Tina' Ebrada and Ms.Teresin Mendezona with Marco Polo Plaza's Food Consultant, Ms. Jessica Avila. Quite a number of dishes are specially prepared by the team and for the record, I couldn't mention anything less than good. 'Best' is actually an understatement. For your guide to satisfaction, here are must-try Treasured Recipes dishes. Maya-Maya ala Bacalao, oven-baked fish smothered in tomato suace and olive oil, and served with potatoes and red bell peper. A salute to her Spanish heritage. Kinilaw na Bangs with Green Mango, tasty Filipino dish of fish "cooked" in a vinegar mix with onions and ginger made even more interesting by adding sliced green mangoes to the dish. Bangus in Coco Cream, Coconut milk based sauce that pays homage to her Ilonggo roots with the addition of achuete. Bicol Express, a spin from the original using string beans and pork belly slices, with coconut milk and chill espada to give it that extra fiery taste. 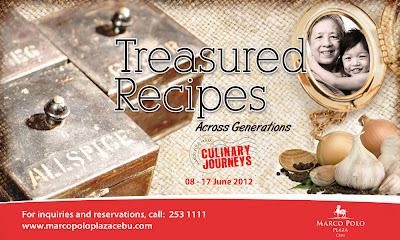 Visit Cafe Marco & join the ten-day Culinary Journey, celebrating the legacy of food, loved and tested through time. 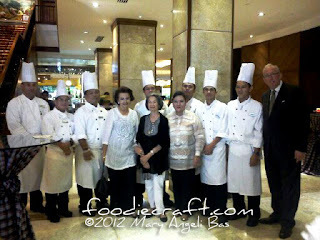 Culinary Journeys: Treasured Recipes runs from 8 to 17 June, 2012.